BA Sculpture graduate and multidisciplinary artist, Imann Gaye received the 2018 Sculpture Futures Prize at this year’s Undergraduate and MFA Fine Art Summer Show. 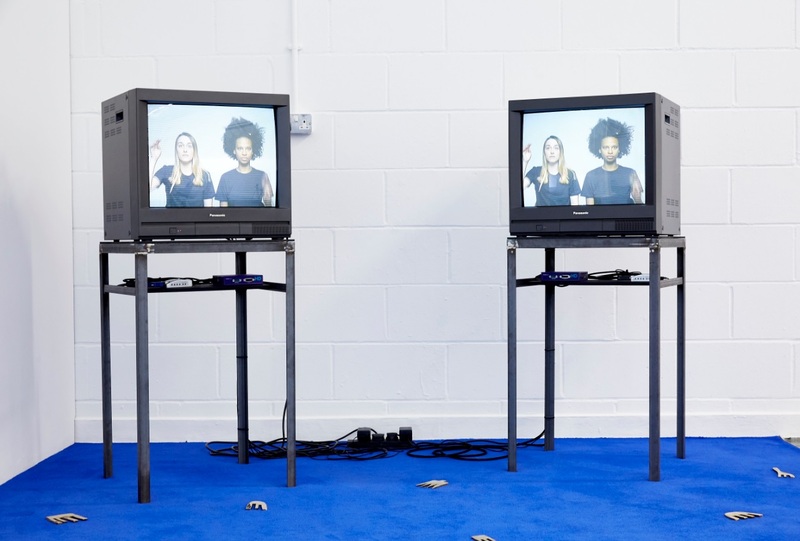 We spoke to Imann about the piece she exhibited at the Summer Show, her current artistic practice and the cultural research underpinnings that inform and inspire her work. Tell us a bit about your background and how you came to study at Wimbledon? I was doing a life modelling sculpture course somewhere in Chelsea while I was working in a bar, and someone suggested that I look into applying for a BA in Sculpture. I did my research and saw that Wimbledon College of Arts had a BA Sculpture so I applied and was offered a place. I hadn’t really contemplated doing an art degree before then. When I was young, my mum would take me to museums and galleries, but I never thought I would study art. When I was accepted on the course I thought ‘I’m going to go for it’. When I came here, I didn’t have much of an idea of what contemporary art was – it was a bit of a shock. Even though I had some experience with life modelling sculpture, contemporary art is very different and has a different way of teaching. I didn’t ‘get’ contemporary art at first, which was actually really fun! It made the experience a lot more interesting. I felt really lost at first but ended up getting really into it. Can you describe your current practice? I use video as a medium for sculpture. As far as I can remember, I have always filmed my work, ever since first year. Every piece of work that I made I would film it, and that was the beginning of picking up on video process. I am interested in sculpture as being ephemeral or an action that is reflected through video processes. My work often features really short actions of maybe 20 seconds that are quite slapstick in nature. I have been looking a lot at the work of John Wood and Paul Harrison, and Roman Signer. My work could be described as test in a sense, for example ‘what happens if I am laying on the floor covered with balloons so I become unseen, and a strong blow of air reveals my body?’ If I am lucky, it will work, but if it doesn’t that’s fine too; it’s all part of the exercise. I like the idea of chance as a process of making work. Some actions are predictable, others become more experimental and have unpredictable results. In second year, I encountered the work of David Hammons, William Pope L., Adrian Piper and Glenn Ligon which led me to research into performance, cultural, post-colonial and whiteness studies. I guess my recent practice is a way to figure out how to combine these two artistic interests: sculpture as an action and cultural studies. I was very interested in the concept of ‘the gaze’ and how people make assumptions based on the simple act of looking. My work looks at how bodies in a space are likely to be affected by a certain gaze, for example how black women have been represented as ‘exotic’. I wanted to investigate where this idea comes from, so was reading about Stuart Hall’s theory of representation and the legacy of Sarah Bartman, discovering how these representations still impact contemporary ways of looking today. I went through a period where my work involved a lot of body performance and making confronting movements that challenge the gaze. I often use a white wall as a representation of whiteness to raise questions of hyper-visibility and invisibility in space. I do also make objects and physical sculptures, but the research behind those is very different from the video work. My practice is mostly rooted in dis-objectifying sculpture through video. Can you talk about the piece you exhibited at the summer show? 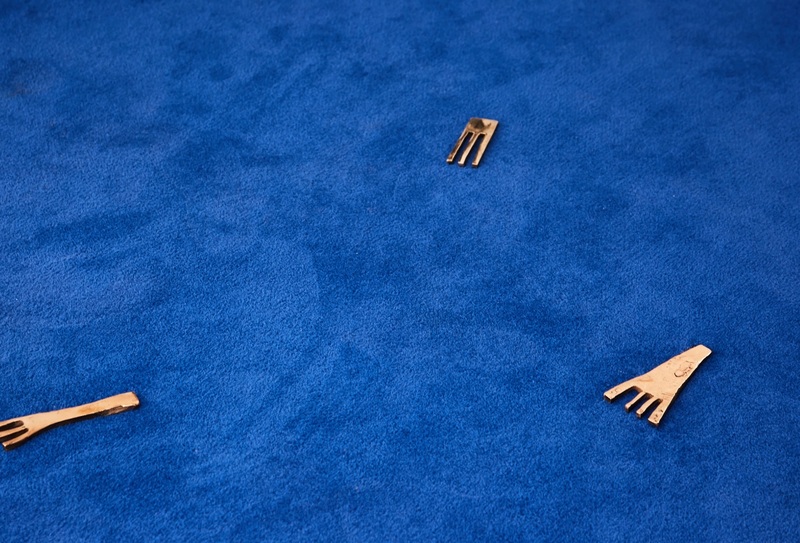 I made an installation with blue carpet, and I displayed some bronze combs on the floor as well as a clear cast resin of hair, but the main piece was the video work. It was a series of 12 videos where I was looking at stillness. I was exploring how stillness can be seen as a move towards resistance and emancipation for the black woman’s body as opposed to the ‘spectacle of the other’ as Stuart Hall wrote. I have used essentially just black and white colours in my video work since my second year. In the present context of the work, the colours are read with racialized meaning whereas that wasn’t intentional in the beginning. Now I am really aware of their meanings and I play with these ideas. Our course leader Sarah Woodfine stepped up in front of everyone at the prize giving and mentioned there was a Sculpture Futures Prize and gave some background information. As she was talking, I leaned into my friend and said “I could never win this”, and then two seconds later Sarah said my name! I didn’t expect it at all. It was really nice to have the recognition for the work and it gave me a lot of confidence in my ability. One piece of advice I would give to prospective fine art students is to develop other interests in the art world outside of your own practice. When you graduate from art school, it can be tough to afford a studio space without having a job, especially if you are living in London. So it’s a good idea to develop an interest in something useful in the arts and then you can pursue that as a job part-time alongside your practice. Some examples could be working as a gallery assistant or in a workshop. Aside from making work, I have another interest I have developed which is to do with museum access, it started with asking the question ‘who is most likely to go to a museum’? This is something I have become really interested in and have been researching, alongside my practice. I had the chance to do my work placement at The Shop of Possibilities (South London Gallery) and then I worked on a few projects with them conducting workshops. I would also encourage students to research more about ‘the history of art’ than what you are told about in school. Often art schools will teach certain references and a certain version of history, and this means that it can exclude lots of important things. It’s the same as museums; you should ask yourself ‘which artists are excluded from this and for what reasons?’ This question is crucial, I think. Decolonise your curriculum yourself. Is there a favourite project or piece of work you completed at Wimbledon? The piece I exhibited at the Summer Show is definitely my favourite. I think it is my most successful piece of work. As an artist, you go through so many different stages, and at the start of my course I was conscious of not focusing too much on one particular medium. I’ve worked with performance, video and casting of objects; I think it’s important to try lots of different things. Towards the end of your course you end up focusing on the medium that represents your work in the best way, and that’s what this final piece represents to me. Rick Lowe, most definitely, and especially the Project Row Houses; I can’t explain how much this project has inspired me. Another area that I am really interested in is how different artistic institutions are investigating deconstructing the idea of what a museum represents for people. Middlesbrough Institute of Modern Art is a good example of this. Alistair Huston, Tania Burgrera and the Museum Of Arte Útil are inspiring to me, but there are many more. Young, contemporary artists whose work I love at the moment are Cheyenne Julien, Lungiswa Gqunta, Maria Hassabi, Georgia Lucas-Going and Fannie Sosa. David Hammons has always been a huge inspiration for me, even his persona. He really doesn’t give a f***! Also, my beloved friend Ibrahim Cisse is a wicked curator. I am going to move to Dakar in Senegal in October. I grew up in France but my dad is from Senegal, and I’ve only been twice in my life, when I was two and then again when I was 24. I just decided now that I’ve finished my degree it’s a good opportunity to do something new, and get to know my dad’s family. Through my research I’ve discovered that there are a lot of community art projects in Dakar that I am hoping to get involved with. I really want to gain experience in coordination of arts programming, so if I can get involved it will be really useful experience for me. I am really looking forward to learn more about Senegalese artists and cultural institutions. I also want to continue my work on the side and find artists that I can assist. You can see more of Imann’s work on her Tumblr page and follow her on Instagram. BA Sculpture at Wimbledon College of Arts still has places available for UK and EU applicants for 2018/19 entry. You can apply for this course via the ‘How to apply’ section on our website.